The habit of complaining over the lack of Khmer (Cambodian language) learning materials, places to study and availability of additional devices is inconvenient for the present day. In fact, some students themselves are lazy learning and lack of confidence or encouragement from their parents at home after the kids studied at school. In the past, after the Khmer Rouge regime in 1979, we faced a very challenging time in education; the monks had no chalk and used charcoal as the substitute in teaching the children at the pagoda. Children also used their fingers to write and draw in the sand and some used pieces of bricks to write on the concrete floor or the wall and table. However, in this age of Information Communication and Technology (ICT), everything becomes available and the smart phones and tablets allows the information to be easily accessible for students at any time. We just install or download the application, “សរសេរខ្មែរ” “Writing Khmer” from https://goo.gl/bGCUHC . The App “សរសេរខ្មែរ” “writing Khmer” recently launched in November 2017 and is used in targeted primary schools of MoEYS with support of Kampuchean Action for Primary Education (KAPE). This App “សរសេរខ្មែរ” is organized by KAPE and developed by InSTEDD iLab Southeast Asia and supported by the SPIDER project from Sweden. This App is developed in close collaboration with the Ministry of Education to support Khmer language acquisition in grade 1 to 3 in primary schools. Students learn interactively with the combination of questions and answers and testing is included as well. During the launch of the App «សរសេរខ្មែរ», KAPE also launched the application, «សៀវភៅឆ្លាត» “smart book”for Khmer reading, listening and speaking, which is sponsored by the United States Agency for International Development (USAID).Each participating primary school received 20 tablets and the parent’s smartphones have been installed with both applications so that they can help their children with their studies at home. Based on a report from USAID in 2015, the results of integrating ICT into the education system show that the dropout rates have declined. According to a pilot project of USAID from 2012-2014 aiming to prevent dropout in Lower Secondary Schools in six provinces; ICT and the installation of computer labs are an important part of this project. As a result, the program managed to reduce the dropout rate with 2,5% among 60,000 students. According promising results of integrating ICT into the education system in secondary schools, some NGOs assisted to filling the gap of available Khmer resources by designing these Apps—writing Khmer and smart books—to help children with their Khmer language. The app provides support to students in grade 1-3 to learn to write, listen, read and speak by themselves with quizzes as well. The app could also be used for kindergarten as well to introduce children to the Khmer language. In addition, the installation of digital learning programs also helps children who learn slowly and are in need of extra support . This is in response to national research conducted by the Ministry of Education in 2015 on the evaluation of grade 3 results , which showed that Khmer language remains weak. Results show that only 30% of grade 3 students manage to correctly write Khmer at the standard for this level. In general, launching the new digital program remains complicated when the App started to be used but after following the instruction of each application and that makes the children like playing this modern educational fun. The importance of learning through standard digital technology has become universal already. International test systems like the TOEFL test, are now available online, which means the candidates do not need to write on test papers which are sent to the US anymore, they can just take the online test directly. Therefore, if the children get used to modern digital educational Apps in Khmer language the benefits are rewarding. They can download other applications, for example international math calculations, which is designed with the general standardused in schools. Story books written in Khmer could also be read online which means that parents or elders do not need to always read for the children anymore. 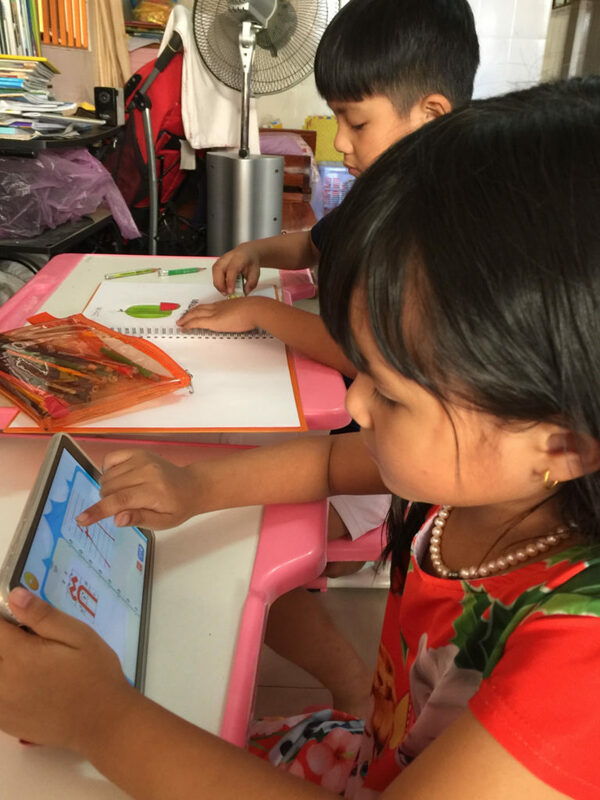 When the children enjoy using the applications and enjoy it, it will increase their interest in the Khmer language and may reduce their preference for learning foreign languages to Khmer as there are so many digital activities available in the English language. Therefore, in accordance with the use of modern technologies and internet service provision, teachers and parents who have smart phones and tablets with Android operating systems should download Khmer language applications for their children to support learning their mother tongue . These apps are more beneficial for their education than playing games and watching videos or allow their children go for a walk. In addition, Cambodian children living abroad or foreigners aiming to learn the Khmer language can download the applications online as well to experience its benefits. Previous Post I swear to end violence against women!